The endosymbiont theory helps us understand evolution because it explains the origin of organelles in eukaryotic cells—those in plants, animals, fungi, and protists. Symbiosis, which occurs at all levels of biological organization, involves two organisms that cooperate for their mutual benefit to gain a competitive advantage—for example, insect pollination of flowers or the digestion of food by gut bacteria. In eukaryotic cells, mitochondria and chloroplasts are organelles involved in the generation of energy required to carry out cell functions. Mitochondria, the site of cellular respiration, use oxygen to break down organic molecules to form ATP (adenosine triphosphate), while chloroplasts in plants—the sites of photosynthesis—use energy derived from the sun to synthesize glucose from carbon dioxide and water. ADDING ONE ORGANELLE AT A TIME. According to the endosymbiont theory, small bacteria (alpha proteobacteria) containing mitochondria were engulfed by primitive eukaryotic cells (protists). In the ensuing symbiotic relationship, the bacterium (now called the symbiont) provided its evolving mitochondria, the generator of energy, while the eukaryotic cell offered protection and nutrients. By an analogous process, a eukaryotic cell engulfed a photosynthetic cyanobacterium that, in time, evolved into a chloroplast. In this description of primary endosymbiosis, one living organism has been engulfed by another. When the product of this primary endosymbiosis is engulfed by another eukaryote, secondary endosymbiosis is said to have occurred. This provides the basis for incorporating additional organelles and expands the number of environments in which eukaryotes can survive. The endosymbiotic theory was first proposed in 1905 for chloroplasts by the Russian botanist Konstantin Mereschkowski (who rejected Darwin’s theory of evolution and actively promoted eugenics), the idea was expanded to include mitochondria in 1920. Endosymbiotic theory gained no scientific traction until 1967, when it was reintroduced by Lynn Margulis, a biology professor at the University of Massachusetts, Amherst (and former wife of the late astronomer Carl Sagan). Her paper was rejected by fifteen journals before being accepted, and is now considered a milestone in endosymbiont theory. SEE ALSO: Prokaryotes (c. 3.9 Billion BCE), Eukaryotes (c. 2 Billion BCE), Photosynthesis (1845), Darwin’s Theory of Natural Selection (1859), Ecological Interactions (1859), Mitochondria and Cellular Respiration (1925), Protist Taxonomy (2005). This image depicts the symbiosis between a fly agaric mushroom (Amanita muscaria) and a birch tree. 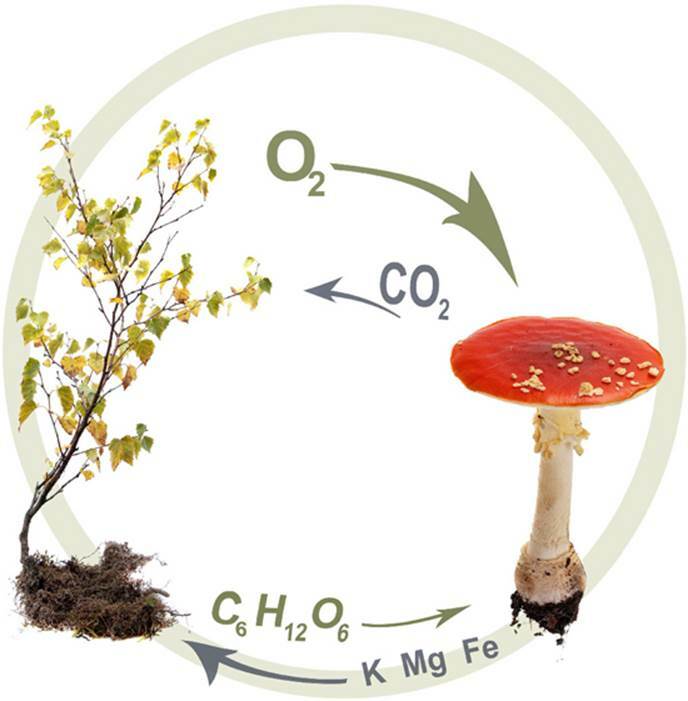 The mushroom receives sugar (C6H12O6) and oxygen from the tree in exchange for minerals and carbon dioxide.